This is part of a series on unusual and interesting places to shop in Edinburgh, themed around different streets. I got the idea as I walked down St. Stephen St. and noticed just how many different types of things that you could buy, in a wide variety of shops. The street is only 0.2 miles long, according to Google maps, but it packs in a lot of variety and character. 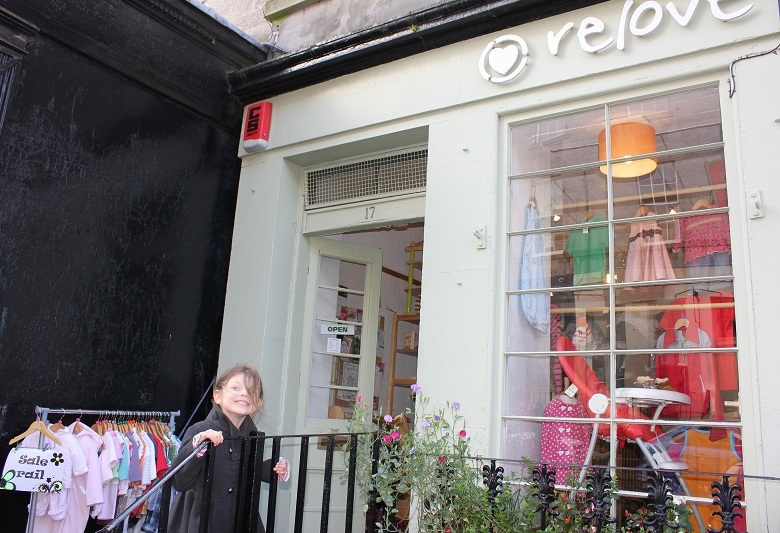 There are art Galleries, Music shops, arts and crafts, children's clothes, fair trade and ethical clothes, cafes, dance classes, interior shops (furnitures, kitchens), pubs, restaurants and more. In fact, in this one short street there are over 40 different businesses, all offering something unique. I've decide to select a few shops to feature in more detail, and I'll also link to some existing reviews of businesses in the street. First up is Dance for All. That's the reason I was in the street in the first place, because on Saturdays I take my two daughters to dance classes there. I spend a couple of hours waiting for one or the other of them every week, and so I've had a little bit of time to explore the shops. You can find my Dance for All review here. After I've dropped the littlest daughter off at ballet, we have to find somewhere to have a coffee and a chat with another Mum while we wait for the next class. Sometimes, we go to Starbucks, but sometimes we explore the surrounding streets a little more, and head off the well-beaten track to that well known shop. That's how we found Sprio, an Italian Lateria and Deli, which I reviewed here. A view of of the outside of Sprio, before we went in for drinks and breakfast. I also sometimes do a bit of shopping while one of the girls is dancing. This weekend I discovered Catalog. It's filled with interesting and unusual furniture, items and accessories for the home. 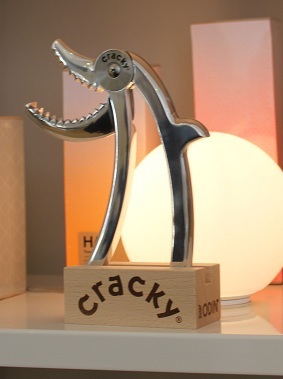 Lori loved the Cracky the nutcracker, sitting proudly on the shelf. I really like the colour theme that wended its way through the shop: greys and greens, and accents of amber. But why stop at buying things for your house? 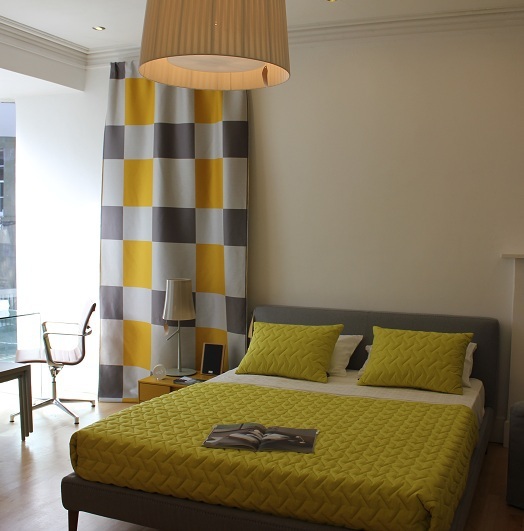 You could also rent a house from Anna Harper Lettings or Zone Letting. Or, you could chill out and relax with a facial in The Face and Body Clinic. Or, you could nip into The Bailie for a quick bite to eat and a drink from the bar. All ready to shop till we drop. Coming out of Relove, Lori and my attention was caught by the music drifting out from the door of the next shop. It was a proper record shop. Lori had never seen a vinyl record before, nor had she seen how one worked. George, one of the owners of Voxbox, was more than happy to show her a record, and then play it for her. She watched, marvelling at how big it was. 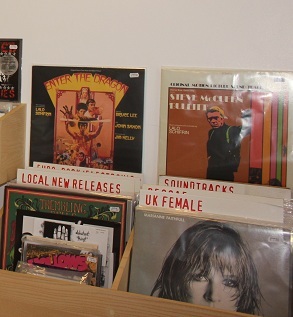 They don't only sell vinyl records though, so you don't need to have a record player to get the benefit of their extensive musical knowledge and collection. I really enjoyed browsing through all the records, and the quality of the sound coming over the shop's sound system was excellent. This is Voxbox. Do come in. 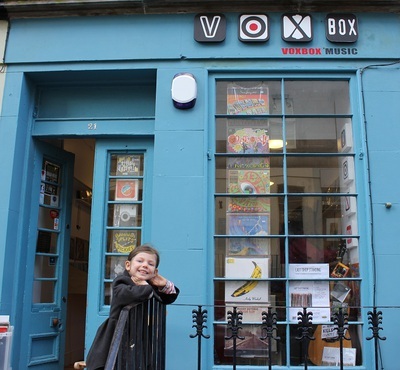 Across the road from Voxbox is the shop that they describe as their big brother in shop form, The Gramophone Emporium, an Edinburgh institution. They sell 78rpm records and the gramophones to play them on and are specialists in opera, classical, jazz and swing. Unlike many of the shops, they do have limited opening hours: Wednesday, Saturday and Sunday afternoons. Finally, to round off our shopping before we picked up Josie, we went into one of the many art galleries on the street. 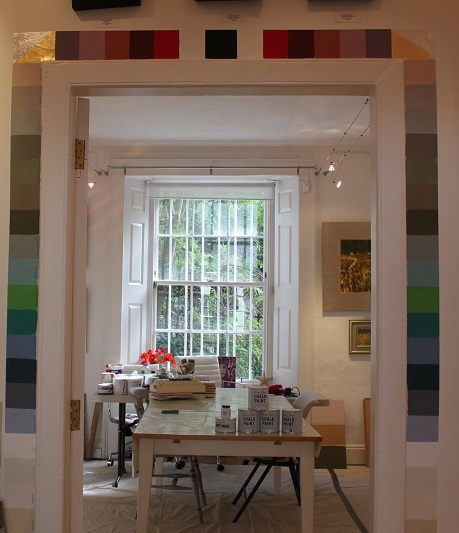 The Laurel Gallery and Workshop is a gorgeous, light-filled shop, with an area at the back to run their workshops. A view through the Laurel Gallery into the workshop area. 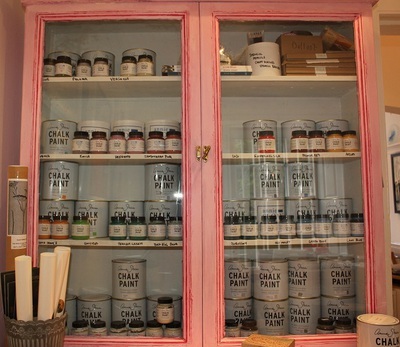 They sell chalk-based paint, which is very kind to the environment and to people. It comes in an array of beautiful colours, which you can see surrounding the doorway in the picture. Many of the workshops centre around using the chalk paint in your home to maximum effect, I am planning to sign up for some during my lunch hour, so watch this space for a review. Even the cabinets they use to display the products are lovely. Want. The owners of many of the shops in St. Stephen Street (and I haven't even talked about most of them) have recognised its huge potential as a fabulous shopping street. They've put together its own website, which has some information on the street, links to some of the websites, and also a very handy street map. 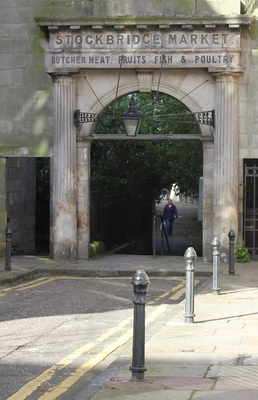 The street has been part of the local trading fabric for a very long time, as this archway shows. 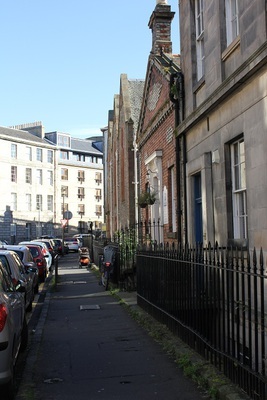 For many years this part of Edinburgh was a vibrant market serving the local community. The traders of St. Stephen Street are doing their bit to maintain that tradition, along with the weekly Stockbridge Market. It makes such a difference to these shops to get a little more custom, and they're truly more deserving of it than huge chain stores and supermarkets. So, if you want to support some local businesses, and a truly get to know a little gem at the heart of Edinburgh, then I highly recommend a visit to St. Stephen Street. Why? A little street packed with shops. Looking forward to visiting some of these shops the next time I am wandering around. Where Should You Visit While at Loch Ness?